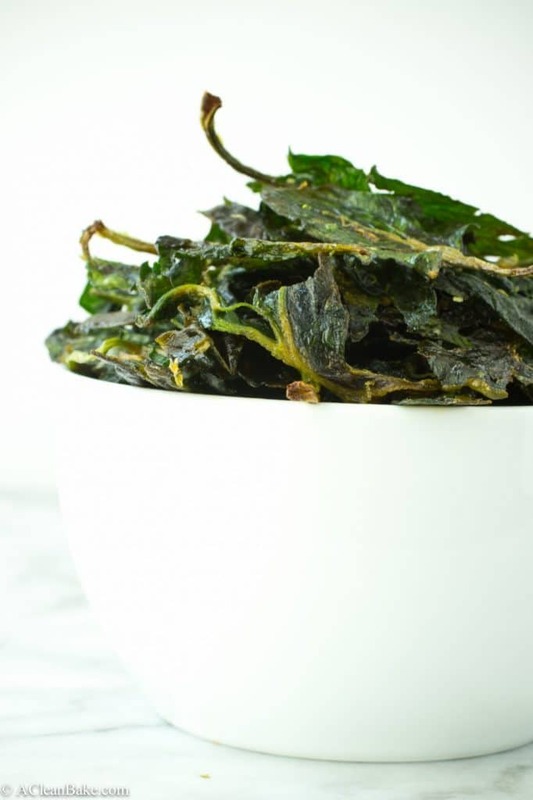 These healthy spinach chips have an addictive salty-citrusy flavor that you’ll love! Wait, don’t go. It’s not as weird/gross/crunchy as it sounds. Actually, spinach chips are crunchy, but crispy-crunchy, not granola-birkenstock-commune crunchy. They’re completely addictive. 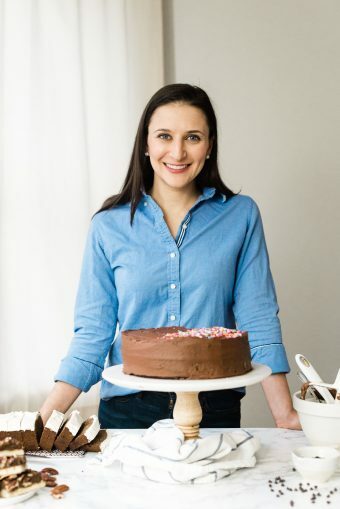 Of all the healthy recipes I’ve posted here, it is always the ones that received the least planning, the least foresight, and were the most impulsive additions to the site that end up being the most popular (ahem.. looking at you, Ratatouille…). This is no exception. First of all: no frying! 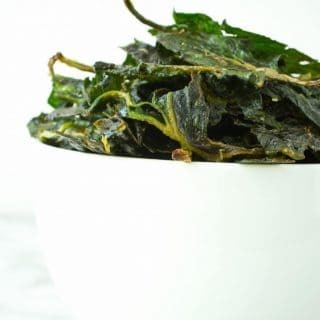 Spinach chips is basically a fancy way of saying baked spinach leaves. You will toss large fresh spinach leaves (don’t use baby spinach; it’s too fragile) in a large bowl with extra virgin olive oil, lime juice, and fine sea salt, and spread them in a single layer on a baking sheet. Pro tip: don’t forget to cover your baking sheet with parchment paper so the delicate, crisp little chips don’t stick to the baking sheet and break when you try to remove them. For a little extra kick, add chili powder or paprika to your spinach chips, or swap the lime for garlic powder. But that’s really all the heavy lifting you’ll have to do. Prep time takes maybe 5 minutes, and the cook time is a little longer (around a half hour), but it’s hands off time in which you can spend doing something else. Consider these oven baked spinach chips to be the healthier, homemade version of those tortilla chips we all know, love, and have eaten our body weight in over the course of our lives. You know what I’m talking about. No more, though. Tostitos are out. Heck, potato chips are out! And, for that matter, consider baked kale chips out too. Kale may be on trend, but spinach is forever. These spinach chips will not last forever, though. Like any good chip, these are salty and flavorful and so satisfyingly crunchy that the whole batch will be inhaled before you know it. And who doesn’t love to eat their veggies in chip form? They are a healthy snack that is delicate and not at all filling, though, so you won’t feel, you know, terrible when you do. Trust me. I’ve tested this theory just for you. Pro tip: it’s probably best to double the recipe right out of the gate. You’ll thank me later. 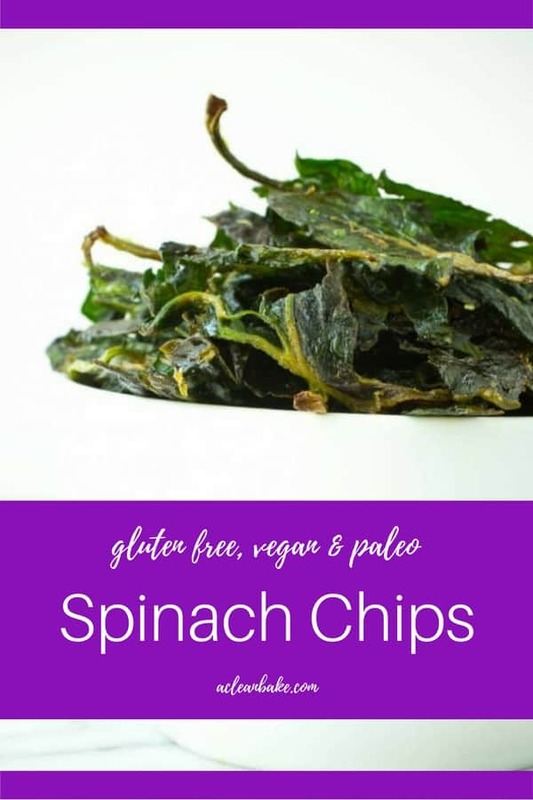 Sea Salt Lime Spinach Chips - gluten-free, vegan, grain-free, & paleo. These healthy homemade chips have an addictive salty-citrusy flavor that you'll love! Preheat the oven to 275F. Line 2 baking sheets with nonstick pads or parchment paper. In a small bowl, use your fingers to rub together the zest and the salt. In a large mixing bowl, toss the spinach with the olive oil to thoroughly coat. Then add the lime salt and toss again to distribute a little bit of the salt on each leaf. Use your hands if necessary. Distribute the spinach between the two prepared cookie sheets in an even layer (do not crowd the leaves). Sprinkle each batch with a teaspoon of lime juice. Bake for 30-35 minutes (you may need less time depending on how fresh your spinach is, so keep an eye on it) until the leaves are withered and very thin. Remove from oven, and let the chips cool completely on the pan before serving. It is best to eat these chips as soon as they've cooled. If you need to store them, the best way is in an open container in the fridge. If you cover them, they'll get soggy though. Even uncovered, they will lose some of their crispness overnight. These are brilliant!!! I love kale chips, but I rarely make them because it takes so long to clean, de-stem, and massage them. I’m definitely going to be making spinach chips from here on out! Oh my goodness. These look so good. I was all excited and ready to grab the baby spinach out of my fridge and make them lickety split until I read your note not to use baby spinach. Drat! I’ll have to wait until the weekend when I go grocery shopping. I’ve been in need to something to snack on and these fit the bill. Ahh sorry about that! You can definitely try with the baby spinach but I don’t think they will have very much substance left once the moisture is baked out of them…. It’s definitely worth a trip to the store for the adult (?) spinach! You had me a sea salt and lime–and then you added spinach, my absolutely favorite veggie! I hadn’t thought to chip-ify spinach but it makes total sense. These look amazing! This is my dream snack. No joke. I love sea salt and lime like nobody’s business and these chips are gorgeous. I’m really wishing my computer screen was a chip bag right now … pinning these! Me too! They’re such great flavors! Thanks for pinning them! I know, isn’t it sort of crazy! But if you can do it with kale, you can do it with spinach! This sounds incredible! Need to get my hands on a lime and I’m making this right away!